1. Have you always been interested in hats? Not at first! I started out in costume and that led to millinery. I grew up going to sewing clubs and tagging along with my mum to quilting shops. I have always loved pattern and the difference between different qualities of fabric. I studied costume design at Wimbledon College of Art, which included a module with a theatrical milliner. I loved it and I carried on doing other millinery courses after graduation with people like Jane Smith to learn more. It’s addictive, learning all the different skills involved, like blocking felt and strip straw. 2. So did you go straight into millinery after leaving college? No – I wanted to practise and study all the skills involved properly, and part of my heart was in costume, so I did lots of courses and lots of dressing all over London, for places like the Royal Opera House, the National Theatre and English National Opera. I also spent 14 months working on a Disney cruise ship, looking after the wardrobe for the cast for the on-board theatre and of course one or two Disney characters! The cruises started in Florida and went round the Bahamas and Caribbean. That was a very different world! But these experiences have helped me to do other work better, such as where I’ve been working over the past year, making hats for Welsh National Opera. I understand that how the hats and costumes are worn and needed during the show affects how they are made and how durable and comfortable they are. You also understand more about the individual. 3. What sort of people buy your hats? I sell through Makerhood and Etsy, but most of my hats are commissions. The work varies – from bridal and casual wear to period millinery. I do quite a bit of freelance theatrical work still: I recently made one for a famous waxworks museum (the display hasn’t opened yet!) and for a workshop at the London Transport Museum. I also help a few other milliners, including Jane Smith. I have helped her make hats for a coronation, Tudor berets for Shakespeare’s Globe and1850s felt toppers for a Charles Dickens movie. I really love designing casual wear hats that the everyday person can afford, though – I would love to bring affordable, stylish hats back to the everyday person worrying about the pennies in their pocket. 4. What is it about hat making that appeals to you? I think it’s a fascinating set of skills – working with different materials such as straw, felt and fabric. It’s also an enjoyable intellectual exercise – especially flat patterning [working out how a flat pattern will form a three-dimensional shape when sewn together]. But I still have to remember the rules about how it looks on the head when it’s finished! I can get lost in the jigsaw, designing a flat pattern or how the pieces work together, but at the end of the day it has to be a hat that is stylish and comfortable that someone wants to wear. 5. What are your favourite materials to work with? I do a lot of felt hats. It’s a very rewarding material to work with. I’ll start with a felt hood that is already made into a cone shape and then steam it for a long time until it suddenly becomes more pliable so I can pull it into shape over a hat block in a crown or brim shape. I either use a wooden block or I carve my own polystyrene blocks, which is a lovely skill in itself – though it’s very messy, as those bits of white polystyrene get everywhere! I also love working with tweeds and interesting patterned fabric. It’s a good excuse to go to quilt shows with my mum and look at interesting fabrics that could be quite versatile, but ultimately produce a lovely finish. I use lots of vintage shades and deep colours but I do have a yellow houndstooth button hat for sale at the moment. 6. Why did you join Makerhood? I heard about Makerhood through Handpicked Brixton on Facebook, and thought it was right up my street. I like to support local traders who have spent time training in skills and love the idea of connecting them to the community around them. The product photography workshop that you ran was really useful. 7. Finally, what’s your favourite bit of Brixton? Brixton is the first place I’ve lived where there are three haberdasheries within walking distance of my home! There’s Simply Fabrics on Atlantic Road, Atlantic Silk Fabrics on Electric Avenue, and Morleys. I didn’t find out about the haberdashery section in Morleys for ages – it is very handy. I wouldn’t be surprised if you found me at the Ritzy later in the week either, and I’ve also been in Duck Egg Café twice this week..
You can buy Jennifer’s classic hats with a twist at http://brixton.makerhood.com/jennifer-levet-hats. 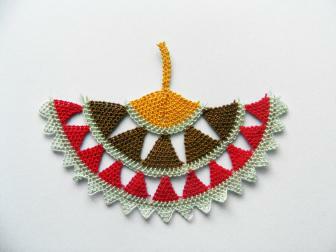 Jennifer also has a stall at Crafty Fox on 24 March. Apologies – we haven’t featured any new makers for a while, but we’ve been a bit snowed under with other things. To make up for it, here’s a bumper selection of makers who have set up stalls in the past couple of months. Jennifer Levet is a theatrical milliner who designs and makes hats for both men and women. Tim Healy of printsforwalls sells his own canvas prints, many featuring Brockwell Park. Mike Fell‘s unusual tape art is only one of his talents – he also produces paintings and prints. Minoworks offers bespoke jewellery and fabrics inspired by history and ancient art. Linda Ecalle of Kafoutch! 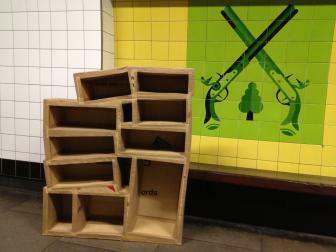 makes very unusual upcycled furniture and accessories from waster materials, like this amazing cardboard shoe rack. Little Ark‘s felt and fabric greetings cards are all designed and handmade in Herne Hill. 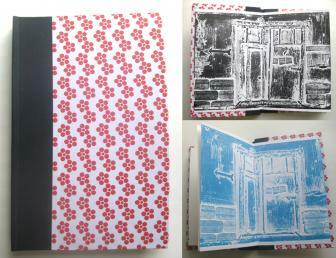 Ann Gordon‘s beautiful handmade books use original prints as end papers. 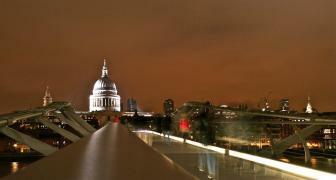 Doyle Photography, based in Camberwell, sells photos taken in London and all over the world, often at night.